I consider myself "somewhat knowledgeable" of Star Wars. I've watched the movies tons of times each (5-6), and read a lot of the books. I've read everything in the New Jedi Order, and have read all of the Old Republic books and Darth Bane books. In my guild I am a Officer and Raid leader. I came into MMO's relatively late (WoW was my first), and have only played for about a year and a half. I was brought in by real life (RL) friends, and brought up to speed for an end content raiding guild quickly. I was only able to progress so quickly (about 4 months) because they had all been playing for years, and were willing to give me their time and experience. Everyone was helpful and willing to take the time to bring me along, and now I play a similar role with our new players. This is the kind of role I am looking for in the guild: someone that can be brought up to speed (although I'll be in the same learning curve as the rest of the guild this time), and then help bring others up. I believe this is the best way to build and keep a strong guild. I really liked everything that I saw about how the guild expects everyone to toe their own weight. Everyone contributes, everyone prospers. I consider myself a dedicated guildie, and competent raider, and I believe that Army of Light will surround me with the same class of player. I expect everyone to take the game and our responsibilities to the guild seriously. I expect everyone to work as hard as their individual abilities allow, and for the rest of us to be willing to help others and the guild be successful. I expect to be able to earn priviliges, and be given my shot when I prove what I can be do. I would like a solid environment to level, PvE, and raid, with others who wish to RP in a SW environment. As explained above, I believe in learning the game, and passing on the skills and experiences. As a former Marine, I know what it means to be a leader, and meet responsibility. I have excellent MMORPG and RL administrative skills, and possess fairly good MMORPG end game raiding skills. To me a quality member is one that expects to bring at least as much to the guild as they would like to take from it. On the SWtoR forums, the guild is very verbal, and I like what everyone had to say. I read through many of the forums, both stickies and threads, and could not find a Charter or Mission statement. I did find Chat and Vent Rules of Conduct though, and agree to follow them. I believe that I do my best to embody the qualities of Respect, Honor, Loyalty, and Maturity. Respect - I think the simplest explanation of this is "do unto others". While I believe that we should always respect others in our words and actions, it is both something simply given and lost. It is very easy to respect others as we would hope they do to us, and we must always be mindful to EARN that respect in turn. If you cannot treat others well, why would they you? Honor - Always think of others first. If you choose to honor others, you should do it for no other reason than you believe it is a basic tenet of life. If you expect others to honor you, perhaps you do not understand the definition. If you live your life to a standard that means not always doing what is easy, but doing what is right, then you understand the definition. There is a saying I read in a SciFi book while in high school (and yup, that's a ways back for me): Est solorus oth mithas. (Any real Dragonlance fans, forgive me if I misspelled it, I INTENTIONALLY didn't look it up. That'd be cheating) "My honor is my life". If I didn't wish to embody that, I'd be planning on rolling a Sith. Loyalty - I believe the strongest measure of loyalty is the perseverance to make the right decision by others and hold to it. When you give your word to someone or a cause, you keep it at all costs. If a friend needs something, you give it. If you can't, you find another way to help. Also, others giving their loyalty to you is also a great responsibility, often a harder burden than staying steadfast as a follower. The loyalty given to a leader is a difficult cross to bear, and the most rewarding. Maturity - Act as a grown up? If there is a scheduled raid, be there. Be early, be prepared. If I'm supposed to be leading an effort, be helpful, control my temper, keep a good positive attitude. Don't be easily frustrated by those that need more help, DO be the example whenever possible. Sometimes it's the simple things. I'm a big "sweat equity" person, and try to be a "do it yourself-er". A couple of weeks ago I ran to home depot to get some supplies, and was walking out with my cart when I saw an older gentleman trying to load several sheets of drywall into his truck with his youngish helper (15ish, grandson??). All I did was help them load several sheets, and it only took 3 minutes out of my life. The best reward was hearing him say to the younger boy "now, remember that someone shouldn't have to ask for you to help them". If I recall the lore from the Old Republic site, and the teachings from Grand Master Skywalker in the books I've read, while Sith are our enemy we do not always try to kill them on sight. Also, this would most likely be a treaty violation, and initiating combat for the sole purpose of an attack would not be the way of a Jedi and could lead to the Dark Side. 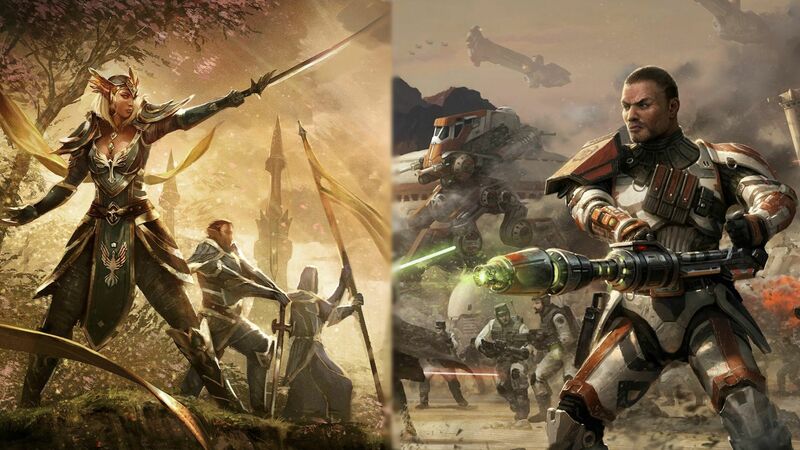 However, if we look at this scenario from the perspective that I believe that SWtoR will be running battles, then the most important thing is the mission. I would try to do a reasonable recon of the area, to determine if we could make it to the comms relay without alerting the Sith. I would remind our team that not every interaction with Sith is the time and place for a battle, and that our objective is the most important. There are people counting on us to take down that comms relay, and if anything we do that deters us from that path could jeopardize our mission. When one of the younger (and inevitably more hot headed) Padawans brings up the point of them coming in support of the relay station, I would only remind them that we have a job to do, and we must trust in the Force to guide us if that happens. I would then lead my team to the comms relay, and trust in the force to make our mission a success. I am someone that has been fortunate to have seen and done many different things in my life. I have, at different times in my life, been a choir boy, band geek, Eagle Scout, U.S. Marine, and an avid Harley-Davidson enthusiast. I am described often by others as a geek in wolf's clothing, because it's not unusual to see some SciFi book in the saddlebags of my Harley. I think the most important thing to be is true to oneself and those close to you. A man's word is his bond, and once broken is extremely hard to re-forge. -Character Physical/Mental Features: 181cm tall and weighs 84 kg. Black hair with some white starting to come in through the temples, and in his beard. Brown eyes reveal a direct, intelligent gaze. -Character Biography: Gole Liath was born to a middle class Coruscant family in a solid working class family. Raised to believe in education from an early age, he excelled in his classes with little effort, and soon found himself bored. More drawn to a close knit group of friends, he nonetheless continued on to university. Although he never found studies difficult, it was a far more relaxed environment, and his attention wandered to females and the finer vintages of Corellian Brandy. Realizing that although his family was paying his way through his education, he needed more time to graduate. Deciding to end his burden on his parents, he enlisted in the Republic Army. During his tour, he noticed that he excelled in areas where he had no experience, and often graduated in the tops of his classes on tactics and leadership. Most importantly, service matured him, and taught him the value of hard work, challenge, and success. After his tour ended, he returned to civilian life, where he completed his education in Computer Forensics and Xenoinformatics. While working on AI systems, he was called to work on computer systems in the Jedi Temple. Watching lightsaber training, he made some chance remarks on the sparring session, comments that the supervising Master found strangely insightful. After testing and careful consideration, he now begins his training and path in the force. Your Application is now Under Review by our Recruitment Council. You will typically receive a response within 48-72 hours. Best of luck to you, Gole Liath. I'm sure you'll find the guild to be one of the best in all of TOR, and you'll certainly get back what you put into it. Welcome, friend of the Republic! Welcome to the AL Gole. Thanks to everyone for all the well wishes and support.